Tonight the Board of Governors of the Academy of Motion Picture Arts and Sciences voted to present the Jean Hersholt Humanitairian Award to philanthropist Jeffrey Katzenberg and Honorary Awards to arts advocate George Stevsn, Jr., documentarian D.A. Pennebaker and stunt performer Hal Needham. “Hal Needham is a legendary stunt performer and coordinator who has worked on more than 300 feature films including “The Spirit of St. Louis,” “How the West Was Won,” “Blazing Saddles,” “Little Big Man” and “Chinatown.” A pioneer in improving stunt technology and safety procedures, Needham also co-founded Stunts Unlimited, and is known for mentoring young stunt performers. In 1986, the Academy presented Needham with a Scientific and Engineering Award for the design and development of the Shotmaker Elite camera car and crane, which allows filmmakers greater versatility in shooting action sequences. Needham made his directorial debut with “Smokey and the Bandit.” He went on to direct such features as “Hooper” and the “Cannonball Run” films. George Stevens, Jr. has spent a lifetime celebrating and preserving the heritage of motion pictures. After several years at the United States Information Agency, where he championed the work of young documentary filmmakers and was Oscar-nominated for producing the documentary short subject “The Five Cities of June,” Stevens went on to become the founding director of the American Film Institute. Under his leadership, the AFI established the Center for Advanced Film Studies, created the AFI Life Achievement Award and embarked on a host of educational initiatives. In 1977, Stevens co-founded the Kennedy Center Honors, which he has produced for the past 34 years. A studio executive, film producer and philanthropist, Jeffrey Katzenberg has been instrumental in raising money for education, art and health-related causes, particularly those benefiting the motion picture industry. During more than two decades as chairman of the board for the Motion Picture and Television Fund, he helped to raise $200 million for the organization, created “The Night Before” event and worked to expand the MPTF campus. He also serves on the boards of such organizations as the California Institute of the Arts, Cedars-Sinai Medical Center, AIDS Project Los Angeles, the Geffen Playhouse, The Michael J. Fox Foundation for Parkinson’s Research, the Simon Wiesenthal Center and the USC School of Cinematic Arts. Katzenberg currently serves as CEO of DreamWorks Animation.” The Academy of Motion Picture Arts and Sciences. Sometimes called Social Bookmarking, this is a method for users to store, organize, manage and search Bookmarked URLs. Bookmarking sites are usually public and links you’ve posted with metadata to include keywords for ease of searches, have the potential to be clicked through and/or read by hundreds or thousands of users. Bookmarking sites contain either a broad subject matter or a specific subject that has a loyal following. Broad subject sites tend to follow the subject structure of an online magazine, e.g. Entertainment, Art, Politics or Lifestyle. Specific sites are by subject, i.e. Technical, and are subdivided into smaller subjects within the Technical framework. Sign up with as many Bookmarking sites as you can, find friends and followers and start bookmarking. Ginger Liu is the Founder (2008) of Ginger Media & Entertainment: Digital Media Marketing & Strategy/PR, Content Producer & Founder of GLIU Photography: Fine Art. Documentary. Social Media Marketing/PR Content & Design Consultant to clients across the globe. Entertainment journalist and travel author. Ginger Liu is a Film Reporter for the Examiner and was a Film Reviewer for IndieWire’s The Playlist and Film & TV Columnist and Reviewer for Regent Media’s Gay Wired. Watch this space for my new off shoot of my WEBZINE/BLOG/WEBASODE/REALITY TV SERIES: The Day in Life, aka: “I Really Want to Direct.” I invite people from all corners of the film and entertainment industry to take part. What people do for a living has always interested me and living in Hollywood, BIZ employees are everywhere. I will be inviting people to answer a number of set questions: the same set of questions goes to everyone, whether you are a brand new Production Assistant or a seasoned Director or Actor. I want to know what you are doing TODAY in your job, not the overall picture, although that will be covered in your introduction, together with some free publicity for you and your project (links to your website, etc). For example, if you are a Prop Master, you will describe what you are working on TODAY, no matter if you think it is interesting or not. I want to know what you are doing TODAY and why. Of course, none of you really have to want to direct. I am genuinely interested in what you do and I’m excited to hear from anyone in the BIZ, big or small. Each person who takes part gets free publicity and a plug for themselves or/and the project they are currently working on; links to websites, etc. And as most Q&A’s can be conducted via email, you can also supply your own photograph, taken on the job. Although I would love to do the honors if and when possible. I got the idea from a Nancy Meyer feature, Holiday, where Cameron Diaz’s character produces trailers. As viewers, we take for granted what we see on the screen and many people aren’t fully aware of all the uniquely important jobs involved in making a movie. 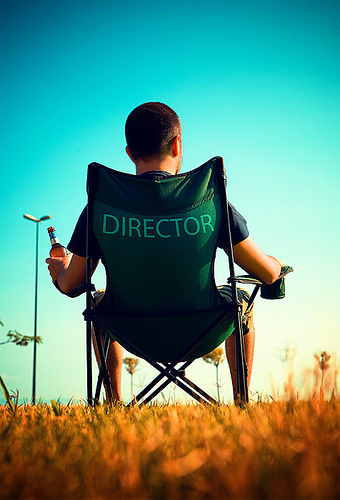 We know the director, producer, and actor gets all the credit and we kind of have an idea what their job entails, but what about the Sound Mixer or the Production Manager, or the Teamster. Giving a title to your career doesn’t tell me much, which is why I wanted to narrow the Q&A down to what the Producer or the Prop Master is actually doing THAT DAY, the whole 12-16 hours.